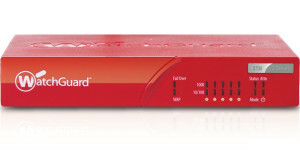 I recently put a Watchguard XTM25 on my home network. Everything was pretty straight forward until I got to port forwarding. I had a couple of ports I wanted forwarded to some internal addresses. 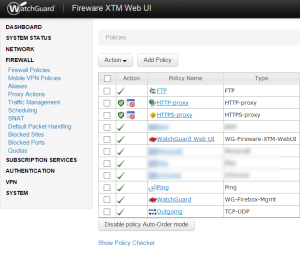 On most firewalls I’ve worked on port forwarding is typically pretty easy to find and setup. Watchguard port forwarding is a combination of two things, one SNAT (static NAT) and a firewall policy. So, you first want to setup the SNAT. It’s found under the Firewall section. Click add, give it a name and then click add under the SNAT members section. This is where you specify the IP address of your internal client that will receive the traffic. You aren’t specifying ports at this point. If you have multiple clients you will be forwarding to you can create them here. I created separate SNAT rules for each of my internal clients. The SNAT members area seems to be able to have multiple members but I’m not sure how that works. 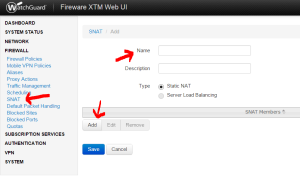 Next you will create a firewall policy that uses the SNAT and specifies the port you want to forward. 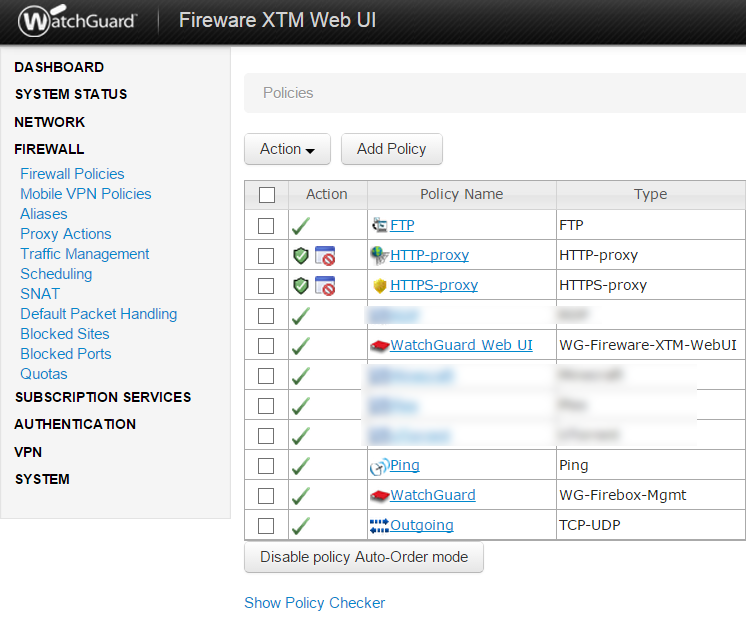 Navigate to the Firewall Policies section. In the Packet Filter drop down select the protocol you want to forward. If you are forwarding a port that’s not listed click custom then click Add and you can give it a name and specify the port. In the From box click Any-Trusted and click remove. Then click the Add button under the From box and select Any then OK. In the To box click Any-External and click Remove. Then click the Add button under the To box and select Static NAT in the Member Type drop down. You should see the Static NAT entry you created previously. Select that and hit OK.
You should now have port forwarding setup for the port and client you specified! You can recreate these steps for each of the ports you need to forward. The HP Stream 7 tablet seems like a good tablet. Solid build, good performance and nice screen. At $99 it’s a very good deal. Also comes with a year of Office 365 which is worth $65ish on its own. 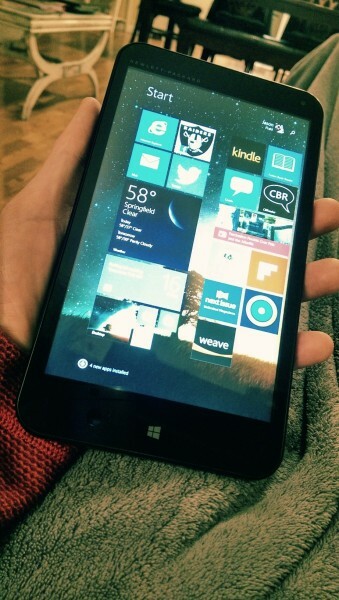 Full Windows 8.1, 1gb of ram, 32gb of storage (though you end up with about 18gb usable) with a micro SD slot. Can’t speak to battery life yet because I haven’t used it long enough. The only bad thing I’ve noticed so far is the speaker is weak and small and on the bottom edge. This is definitely a nice alternative to a Kindle fire and far less expensive than an iPad (with a much better operating system in my opinion). On the battery life I would say it’s on the low end for a tablet. It’s around 5 1/2 hours of web browsing, email and such. That’s not long compared to many tablets out there but at $99 that’s not bad either. Unless you are a traveler and need longer or you have no life and can spend 8 hours a day on a tablet For the way I use this size of a tablet 5 1/2 hours is fine. And if you were just reading books and not surfing as much that would probably be more like 6 1/2 hours. A Kindle Fire is going to last longer probably closer to 8 hours and an iPad mini is probably 9 to 9 and a half. But each of those costs more, especially the iPad mini which starts at $400 unless you get a previous model which will still be $300ish. A major issue I’ve found is the headphone jack on this is horrible. It has bad static and a slight buzz. If you are playing music you don’t notice it unless the music gets quiet and between tracks. This only happens when you have headphones plugged in but when you do it’s very noticeable. When you have a low cost device there are going to be compromises but this seems like something you shouldn’t see (or hear) these days. This one is a puzzling issue to me, how HP would put it out like this I don’t really understand. I found a couple of others who reviewed this tablet and mentioned the sound issue to so I don’t think I’ve just got a bad one. Very disappointing considering I really liked everything else about this tablet. I’ve mentioned in the past that I use a HTPC (Home Theater PC) for streaming movies from my local network (a network share on a Windows server) to my TV. There has been a huge amount of streaming boxes hit the market lately and I’ve tried many of them. I use a Roku 3 for most Netflix, Hulu, Amazon and Pandora activitiy. When it comes to streaming local content XBMC is hands down the best (see my previous post about using it with Windows 8). I do have Plex on my Roku and the server piece on a server where I store my videos. Plex works well and is on all platforms. I just like playing the native video file as it is and not have to transcode to a client. I also just really like the interface of XBMC. I had hoped the port of XBMC to the Ouya would possibly replace my HTPC but I don’t think it’s been released yet and I’m not super optimistic that it will be as nice and fluid. So my Ouya sits mostly untouched for now. To this end I’ve been on a never ending quest to find the right remote control for my HTPC. I’ve tried many different remotes. The one that came the closest but still wasn’t quite there was the Logitech diNovo (goofy name) mini PC entertainment keyboard. It’s actually a very nice keyboard and remote but it’s a bit awkward, somewhat overpriced and I never got really comfortable using it. Before this I used a remote from nMediaPC. It worked well most of the time but didn’t have an integrated keyboard. It came with a normal sized wireless keyboard that was too big and bulky. It didn’t take long for the trackball mouse to start acting up. Before this I had also tried the Rii Mini Keyboard with touch pad. This one was not bad. The keyboard worked well though the touch pad could be a bit sensative. It was backlit and is a good price on Amazon. My problem with this one was battery life and it was a bit awkward in the hand. It seemed like the battery was dead every time I picked it up, especially after sitting for a week or so unused. It’s also not really a one handed remote which I prefer. I also tended to have some sticking keys sometimes. Before that one there were many more. I like experimenting and the old devices tucked away in my closets show this. I could probably dig up and photograph 5 or 6 more remotes but I won’t bore you with that. So, my current and so far favorite HTPC remote? It’s the MCE Remote Control by Feilan. I purchased it from Amazon for about $26. 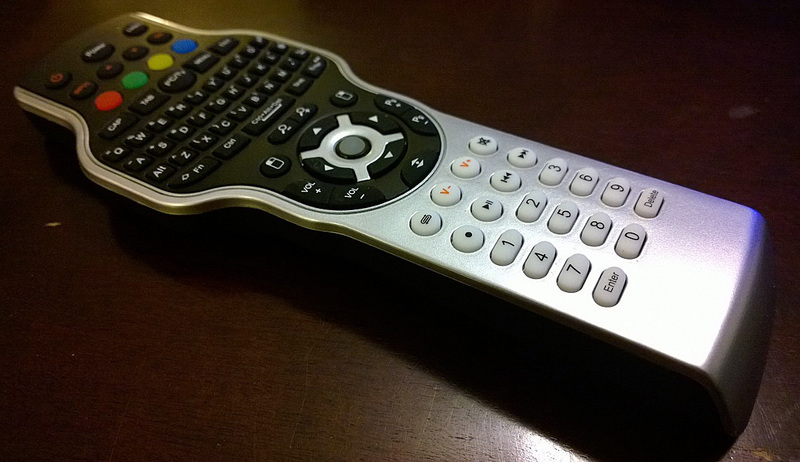 The remote has a keyboard integrated into it. A trackball (kind of small) for mouse activities. This also is a learning universal remote so I’ve programmed some of the buttons to turn on my TV and home theater systems. 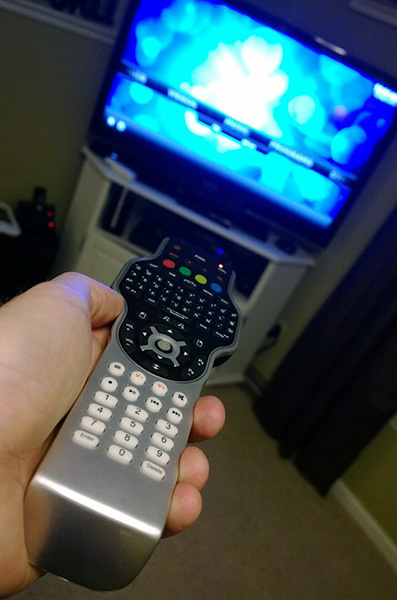 The remote is nice to hold in the hand and isn’t cheap feeling like some I’ve used. The keys all work well, though there’s a few that are too close to other keys like the left and right cursor. The battery life is great. It has zoom in and out buttons which are nice for browsing the web. The ctrl-alt-del function is a nice touch for those times Windows or an application isn’t acting right. The play, volume and other buttons work well with XBMC. The instructions that came with it are pretty sparse (poorly translated from Chinese) and there’s no real online help. I’ve tested and used the remote with both Windows 7 and 8. Overall it’s a great remote and I don’t plan on looking for a replacement just yet. 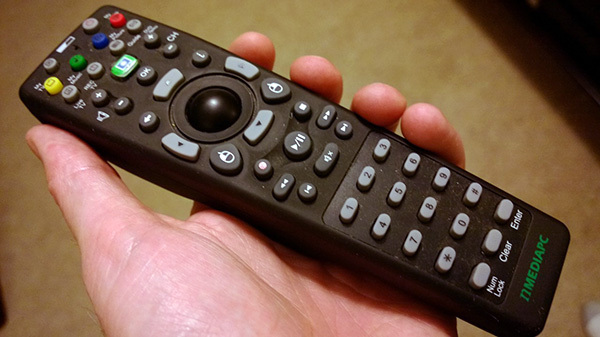 I’ve had the remote for about 6 months and it’s performance has been reliable and consistent. I did notice on the Feilan website there’s another version (actually several versions that all look very similar) of the remote that has back lighting that would be nice but I haven’t found anywhere to buy it just yet. That would be the only reason right now to replace it. I’ve been an iPad user from the beginning. I had used an iPhone for awhile before the iPad came out and quickly realized that iOS would be great on a tablet. I pre-ordered the iPad and have been using one ever since. 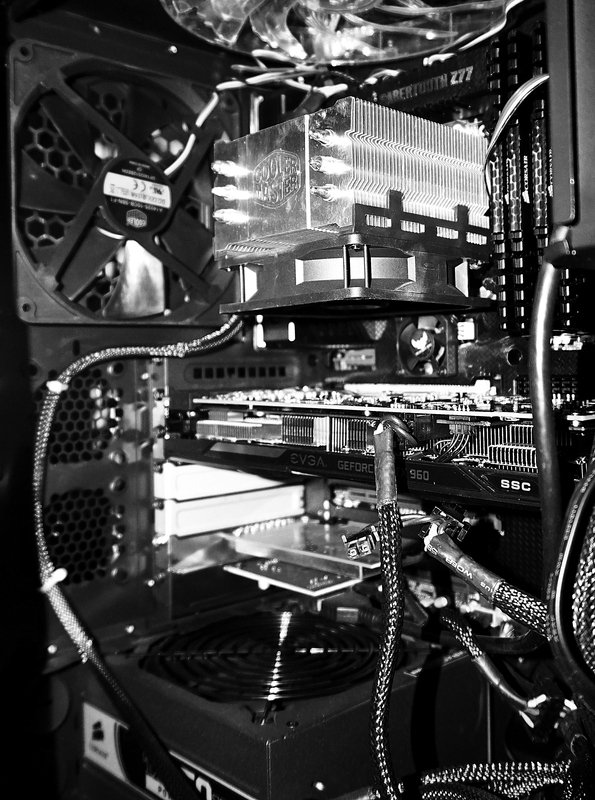 It’s the form factor that I’ve wanted for years. I had tried multiple Windows based tablets but they never performed very well. They had either bad battery life or bad hardware design coupled with the fact that full blown Windows (current versions and back) is not a viable tablet OS. Windows 8 looks to change that trend but that’s still to be seen. I’ve tried Android a few times. I wanted to like it but never did. Especially not on a phone. The tablets up to this point were disappointments when compared to the iPad. 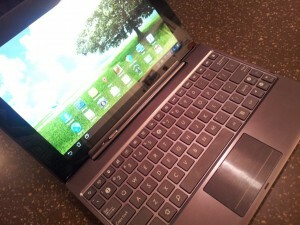 The first Asus Transformer was a great piece of hardware but I still did not feel Android was well suited for a tablet. Don’t get me wrong, it worked as a tablet. I could read books, listen to music and surf the web. The experience paled in comparison to the iPad though. 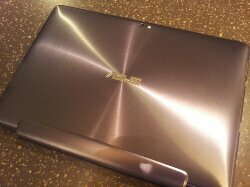 I got my hands on the new Asus Transformer Prime and after a rocky start I am beginning to see a competitor to the iPad experience. My problems started right from the start. When you turn on the tablet for the first time you get the welcome and initial setup screens. On the third or so screen I began experiencing crashes of DMClient (still not sure what it is). I did a few factory resets with no luck in getting it to run stable. I also was having Wifi issues. Some sites wouldn’t let me login, some apps wouldn’t work at all and overall just weirdness. I tried to get it to update but that caused more crashes. After downloading the latest firmware (prior to 4.0’s release) and several reboots it was updated but still crashed and had spotty Wifi. That same night Asus released 4.0 (Ice Cream Sandwich) 2 or 3 days early. I couldn’t get it to update and went to bed frustrated and decided to return it the next day. The next morning I figured I’d give it one more try. I found some instructions that had me go to the applications app, delete data from the DMClient service, force it to stop and then rebooted. On reboot I was able to check for an update and got it installed. Right from the first boot of 4.0 I could tell it was doing better and the device has run perfect ever since. 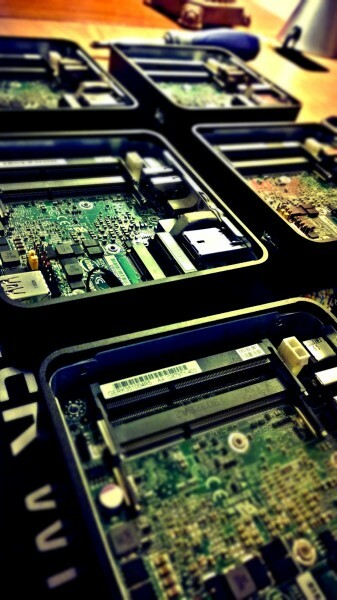 The hardware of the Transformer Prime is nice. Just like it’s previous version it’s well made and solid. Every time I pick it up I’m reminded of how cool it is. The dimensions of this version are better in my opinion. I found the original Transformer to be awkward to hold. I also purchased the keyboard dock and have to say that it is awesome. I’ve used a keyboard a few times with the iPad and it was never really of much use to me. This keyboard dock is very well integrated with the tablet and it adds to the tablet in many ways (typing, battery life, touch pad, SD card slot and USB port). I can’t speak to the cameras (front and rear) because I haven’t used them nor will I most likely. I never used it on the iPad (not just because they weren’t very good). I can see using them for something like Skype but I just don’t currently have the need. This tablet is almost identical in thickness between it and the iPad 2, but it seems to weigh less. I tend to be sensitive to heat. I can’t take laptops where the wrist rest area gets hot on one side or the other. I’m happy to say the Transformer Prime hasn’t had any heat issues. I haven’t had time to watch a movie on it or play an intense game on it for a period of time to see if it warms up any. Apples’s iPad and iOS has been the king of the tablet market for two years now. I’ve tried to like Android for awhile but never felt it met the experience of the iPad. I still prefer Windows Phone on my smartphone but Android 4.0 has reached a level that I can feel confident in using on a regular basis. The updates to 4.0 are mostly small things but they add up to a much more pleasurable user experience. The first thing I noticed was the font used through out the system it’s a fantastic standardization that Microsoft learned to do with it’s Metro UI. The other updates are welcome polishes as well such as the updated settings area. I’m still confused by the quality of the built in web browser though. Web browsing is one of the key uses for a tablet and the stock browser is not very good. Luckily there are many other browsers to choose from in the marketplace and I particularly like the Dolphin browser. The gesture functionality of Dolphin is really cool. One aspect to Android still puzzles me and that’s the multi-tasking. I’m still not sure what exactly is left running in the background and what isn’t. It seems like there is a performance hit after using Android for several hours and I feel the need to go use a task killer application to make sure other apps are shut down. I need to spend some more time in understanding and controlling the background services and apps. The lack of polish and maturity of the apps for Android was another reason I avoided it. They always seemed like they didn’t get nearly as much attention as their iOS counterparts. Apps like Dropbox, Facebook, WordPress, Kindle, Amazon and others are at a much higher quality and offer the same or better experience than on iOS. I’ve used a keyboard dock with the iPad and it seemed like all it did was give me a physical keyboard. It was and afterthought. 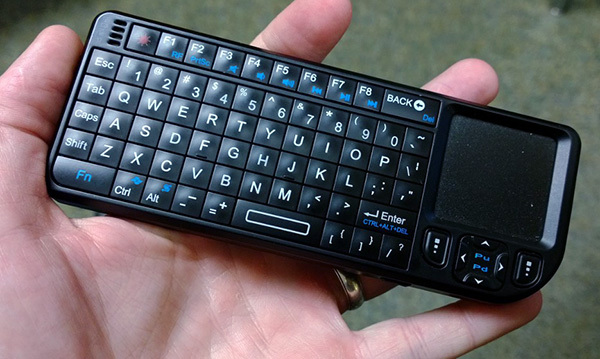 This keyboard dock adds much to the functionality of the device. It give extra battery life, a USB port (so far all I’ve connected is a mouse, both wired and wireless), an SD Card slot and a touchpad. The mouse/touchpad was a surprising touch that works much better than I expected. When you use the touchpad or a mouse you get an actual mouse cursor which makes certain functions much easier. When the tablet is docked into the keyboard and it’s shut it looks and feels like a very thin high quality netbook but functions much better than any netbook I’ve ever used. The other thing the keyboard dock has done is made me realize that I need touchscreen capabilities on my Windows laptop..now. I never thought I’d want to reach up and touch the screen on my laptop but I do it a lot on this and love the added input capability. I’m sure it will be commonplace in a few years after Windows 8 comes out and I can’t wait. Like I said I had a bit of a rocky start to the Transformer Prime. It was a frustrating experience and I can see several people returning the device before getting to a stable point of usability. I’ve been an avid iPad user since the first one launched. 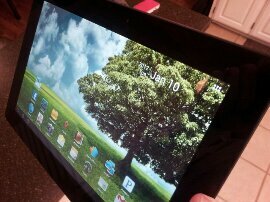 This version of Android brings me to a place where I am comfortable suggesting it as a viable tablet OS. The Kindle Fire is a great Android device meant for a different crowd then the Transformer Prime. The hardware has been good on the Android tablets for awhile. The first Transformer was a solid device. The Samsung Galaxy tabs are nice machines as well. 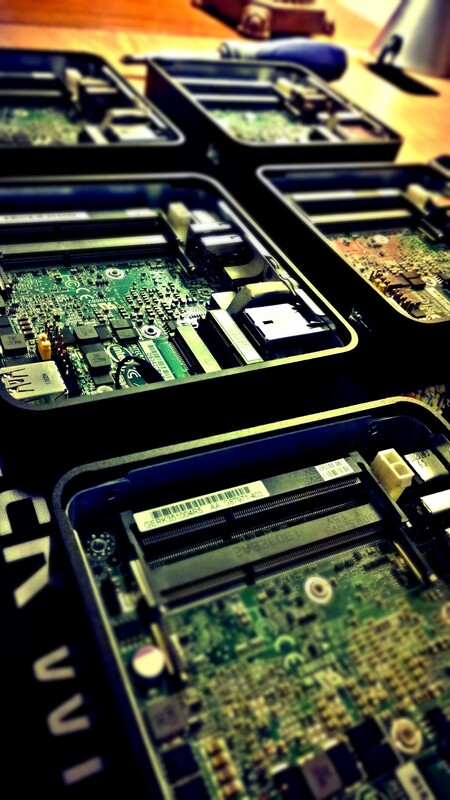 The combination of the the Tegra 3 processor and Android 4.0 make this a very nice experience. In the past I’ve made an attempt to honestly use the other tablets and became frustrated very fast. 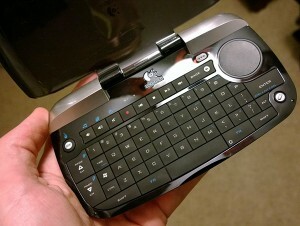 The Transformer Prime is a fantastic tablet especially when you combine the keyboard dock. Although the price of the two together might turn away many people. Besides, I’m seriously attracted to the device because of the name. Even if they are getting sued for using it. The only other negative thing I’d mention is even between the time that I placed the order to when I received the Transformer Prime, Asus announced the next generation of Transformer Prime. So, of course, I already have a tablet that will be obsolete in a short period. The next generation is said to have a full 1080p resolution screen, a better Wifi antenna and a few other features. That’s the nature of technology these days though. 1/12/2012 – I picked up the Transformer Prime today and felt something drop from my hand. Turns out it was my microSD card that I had in the slot on the side of the Transformer. The card sticks out just enough that it’s fairly easy to accidentally make it pop out of the slot. Luckily I felt it hit my had before it dropped to the floor. Since it’s a 64gb microSD card I’d have been quite disappointed to lose it. 1/20/2012 – I’ve used the Transformer Prime for the past week and a half and have to say I’m loving it. Like I said in the post, I’ve been a die hard iPad user since they came out and I haven’t missed the iPad the whole time. I’ve read books (or more accurately one long book), surfed much of the internets, watched movies, written blog posts and more. The HDMI out works really well. It requires a micro HDMI to standard HDMI cable which I found cheap on Amazon.com. I’ve since found out there is HDMI (like on your TV), micro HDMI and mini HDMI. Loading up books, videos and music using the microSD card is awesome. That’s definitely one feature that the iPad cannot do. My gripes so far? The USB charging is annoying. You have to use the USB wall charger that came with the tablet and not just any USB wall charger. I’ve plugged in the USB cable to multiple (I have many of the things from various devices) USB wall chargers and none work to charge the device. That’s just silly. The GPS is flakey. This is acknowledged by Asus and is one of the primary reasons (from what I’ve read) that they are releasing a new version of the Transformer Prime in June or July. The aluminum body is causing it to not work very well (again from what I’ve read, I’m no GPS expert). Currently my device says I’m in Branson, MO which is a town about 45 minutes from where I’m sitting right now. Asus released a new firmware update yesterday that was supposed to help the GPS but it seems no different to me so far. I just turn off the GPS and location services, I’m not going to use it in my car for navigating. I have a dedicated GPS device for that anyways as well as my phone. Overall I’m liking the device a lot. I recently setup the home version of Astaro for my firewall because I use it at work and like how it works and how you configure it. After setting it up my wife’s laptop starting having problems sending email. It was receiving email ok, but couldn’t send. After some poking around the standard Astaro setup allows for SMTP SSL traffic through port 465 but Google uses port 587. To fix it I added a Google SMTP SSL service definition to the Email Messaging service group. The Email Messaging service group was setup during the initial installation as allowed traffic through the firewall. To add the Google SSL port: from the service definitions section locate the Email Messaging group and click the plus to add a new service definition. Name it what you want make the port 587 and you are good to go. After recently replacing my main router on my home network with a Cisco e4200 and updating it with DD-WRT, my xBox refused to get an IP address from the DHCP server. I could see the IP lease on the router and even after deleting the lease it would generate another lease. 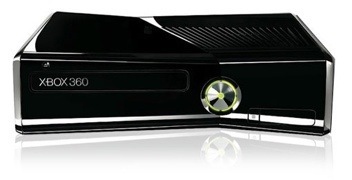 But the xBox itself would not use the IP address. I noticed the default lease lifetime was set to 0 and thought I’d try changing it to something else for the heck of it. I set it to 1440 (which is 24 hours) and voila it worked. All other devices were functioning ok at 0, not sure why the Xbox didn’t like it. Oh well. 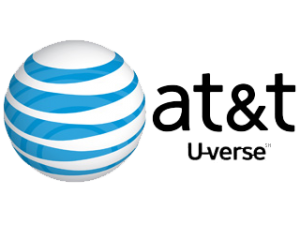 I recently got AT&T’s U-verse service at home and have been enjoying it so far. The internet has been working much better than my Mediacom service had been doing. My only issue was that I wanted more control over the router and I wanted to setup VPN access into my home network. So, I installed DD-WRT on my Cisco E4200 wireless access point/router then got the AT&T setup in DMZ mode to pass traffic to the E4200. Basically, the DMZ mode on the AT&T router was causing the DD-WRT to renew it’s lease every 5 to 10 minutes. The DHCP responses were being blocked by the DD-WRT firewall. Be sure to check out the above website where I got the fix from. They have a lot of tips and fixes for other issues as well. I’ve been playing with the new Asus T91 convertible netbook today. So far I’m liking it. It comes with some custom touch screen apps that are cute and all but I didn’t care for them much. Dang this keyboard is small, but I’m getting used to it. I don’t care much for the glossy finish, fingerprint city. The touch screen is very responsive and accurate. There’s more heat from the bottom of it than I expected since it’s a SSD drive. Super quiet, not hardly any noise out it. Probably why I’m feeling as much heat as I am. Dang this keyboard is small. I just deleted 2 sentences accidently. There’s a lot of extra software, like Office trial, Microsoft works, skype and other crap. Though I guess everyone does that now. The system is pretty responsive under both XP and Windows 7. The swivel top is solid and turns smoothly. Screen brightness and clarity are excellent, I haven’t tried it outside in sunlight yet. The custom touch screen software (memos, foto fun and 3D interface) is cute and looks professional, but not something I’d use on a regular basis. The 3D interface works well most of the time, a little laggy at times. I’ve installed Windows 7 RC on it and everything is working so far. I have an unknown device in the device manager that I’ll have to figure out. The Asus drivers website doesn’t have Windows 7 as an option just yet for downloading drivers. The default install picked up the sound, wireless, nic etc. The video started out as standard vga and then updated to the Intel media accelerator 500 on it’s own. The unknown device might be the bluetooth since I don’t see it anywhere, though it might be the camera too. The unit came with a 16gb SD card which I wasn’t expecting. I’ll update in a few days after I install some more stuff on it and experiment some more. My main use for the device will be using it to connect into work and fix server and other network issues as well as reading eBooks, surfing the web, email and watching videos on it (curious to see how it handles videos). The unknown device ended up being ACPI. I tried the XP drivers which didn’t work and kept popping up an error. The next time I booted the machine Windows 7 popped up a message that said “There seems to be an issue with your power managment would you like to fix it?” Why yes, thanks. It then took had a link to an ACPI driver from Asus which downloaded and installed fixing this issue. I streamed some TV shows (xvid AVI’s) across my network and watched them on the T91, they worked without a hitch. I haven’t tried Hulu or Netflix streaming just yet. After installing the ACPI I now have an icon that let’s me change screen resolution and turn on or off the wireless and bluetooth. When I enabled the bluetooth it installed drivers. I haven’t tried any bluetooth devices on it yet. The heat issue seems to be mostly when the power adapter is connected and it’s charging the battery. I used the machine to surf the web in the tablet position on battery power and it did get warm, but not as much as it did the night before when plugged in. of other apps that just are easier to use on a higher resolution. I’ve installed a few smaller games (Pop cap stuff) and they ran just fine. I’m running those games from the SD Card. I tried Crayon Physics Deluxe (installed to the main ssd drive) and it choked on it even with the resolution down and in windowed mode. Next I tried Quake 3 (running from the sd card) for kicks and it ran pretty good. One weird issue i ran into is the Eee PC tray utility crashes from time to time. With this utility you change the screen resolution and turn on or off the wireless etc. I can’t get the button that’s on the monitor bezel to work in Windows 7 just yet. It’s supposed to be used to change the display from landscape to portrait. But you can use the Intel tool or the built in Windows mobility center. As far as applications I’ve installed Photoshop 7 (figured it would run better and take up less space than CS4, plus I don’t need all of CS4 on here anyways), Open Office (where I’m typing this up). After installing these applications plus Windows I’ve got 5.3gb free on the C drive. On the E drive (the sd card) I have about 14gb free. I did also move the My Documents and My Music folders to the E drive. I’d like to re-iterate one point, this keyboard is small. I’m getting better but the right shift key is trouble for me and I keep hitting the caps lock. For some reason I miss the space bar frequently. The speed on the device is a bit slower than I expected compared to some of the netbooks I’ve used in the past but for the ways I’m using it it works well. I did turn off the themes in Windows 7 which helped a lot on the performance as well as going through and shutting down services that I don’t need. One other quirk that I’ve found is everytime I boot the machine the display brightness is lowered even though it’s plugged into the wall. It’s easily fixed by hitting fn & F4 but it’s kinda annoying. Overall I’m really liking the machine. I did find out one very useful thing from the Intel video utility. You can hit ctrl-alt and left, right up or down to quickly rotate the screen layout. Also the default Windows 7 webcam drivers work and I tested it with MSN messenger. I still need to try the Bluetooth.